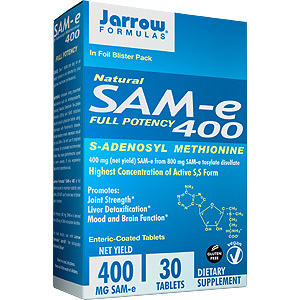 Jarrow Formulas pharmaceutical grade, stabilized SAM-e 400 is a full 400 mg elemental SAM-e from 800 mg of SAM-e tosylate disulfate. SAM-e 400 is manufactured under low temperature and low humidity and is enteric-coated to ensure a biologically active product. SAM-e (S-Adenosylmethionine) is a chiral molecule and therefore consists of two forms: (S, S) SAM-e and (R, S) SAM-e. The biologically active form is the (S, S) structure, while the (R, S) structure is biologically inactive. Joint Strength: SAM-e supports the production of healthy connective tissue through transulfuration. In this process, critical components of connective tissue, including glucosamine and the chondroitin sulfates, are sulfated by SAM-e metabolites. Brain Metabolism: SAM-e methylation reactions are involved in the synthesis of neurotransmitters such as L-dopa, dopamine and related hormones, epinephrine and phosphatidylcholine (a component of lecithin). Longevity: Methylation of DNA appears to be important in the suppression of errors in DNA replication. Demethylation of DNA is considered a contributor to the aging process. 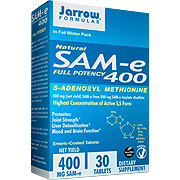 Proper methylation through substances such as SAM-e positively influences longevity. Liver: SAM-e metabolism supports the synthesis of glutathione (GSH) and glutathione-dependent enzymes (glutathione peroxidase and glutathione-S-transferase), which are substances important for liver function. Take 1 tablet per day on an empty stomach, or as directed by your qualified health consultant. WARNING: Individuals using prescribed medications such as antidepressants, including Serotonin Re-Uptake Inhibitors and MAO Inhibitors should consult a physician before using. Individuals with Parkinson's disease, bi-polar disorder or manic depression should not use SAM-e. SAM-e 400 is foil blisterpacked to maximize stability and safety. Do not use if outer seal of blister pack is broken. Other Ingredients: Microcrystalline cellulose, enteric coating (methacrylate copolymers), glycerol behenate, talc, triethylcitrate, glycerol palmitostearate, medium chain triglycerides, silicon dioxide, titanium dioxide, magnesium stearate and riboflavin. Suitable for vegetarians. This product complies with the proposed USP Monograph for SAM-e.
SAM-e 400 - is shipped in a discrete, unmarked package. Orders are processed immediately and usually take about 3 to 5 working days to be received. We do ask that you try it for 2 to 3 weeks to feel the full effects. Any informaiton received is used only for order processing and shipping purposes. Your information, such as e-mail address, will never be disclosed to a third party.